&Made is a burger joint by the Delicia Group and Chef Bruno Menard, who previously helmed a 3-Michelin Star restaurant in Tokyo. I have high expectations of my burgers, so I was very eager to try out their renditions. I have been to &Made several times, and while their burgers are made of good quality ingredients, they lack a certain ‘oomph’. In short, they are decent, but not life-changing. That said, I still believe that &Made is worth a visit for two reasons. First, the location at Pacific Plaza is not only very convenient, but also relatively quiet – I can have a nice dinner without facing the crazy crowd in town. Second, the burgers, while not out-of-this-world good, are simple and comforting – something that I can eat on a regular basis. When &Made first opened, there was a lot of fanfare, but since then, the hype has died down and it is not as crowded as before. However, I actually like it better this way, as the peace and space makes it a much nicer place to dine in and enjoy my food. The menu is tight and focuses on burgers. 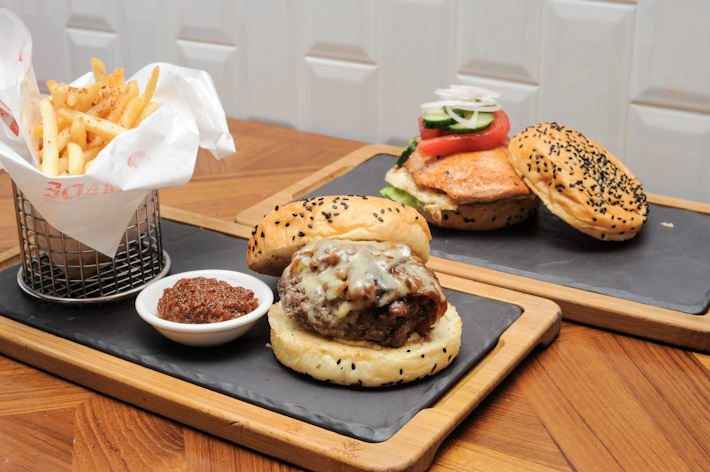 They include The 3 Little Pigs (S$23), a burger with pork fillet, bacon and chorizo patty; The Chicken (S$17), a roasted chicken breast burger; The Honey Salmon (S$21), a pan-seared Atlantic salmon burger; The ‘B’ Burger (S$19), the classic burger with a dry aged beef patty top with caramelised onion, cheese and garlic mayonnaise. The burgers are served with really good fries and homemade BBQ sauce, and you can top up S$3 for an upgrade to irresistible truffle fries. You can also challenge Chef Bruno and build your burger from scratch. Start by choosing your preferred patty – dry aged beef, pork, lamb, chicken or salmon. Then, decide on the sauces – there are special creations like black truffle mayonnaise, yuzu-kosho mayonnaise, and avocado yogurt sauce. Finally, pile on the ingredients – add a fried egg or throw in some bacon, or indulge with the pan seared foie gras. Also, &Made shares the space at Pacific Plaza with L’Entrecôte Express – its sister restaurant – and you can order from both menus. If you do not feel like having burger, you can go for the much-lauded Steak Frites from L’Entrecôte. For desserts, go for the whimsical Lollipop Waffle (S$9) served with caramel, white and dark chocolate sauce, Hot Chocolate Lava Cake (S$15), or Sundaes (S$12). If not, wash down everything with a Milkshake (S$9). I can’t believe you expect your burger to be life-changing.